Was Brandy Really a Fine Girl? It goes without saying (but, of course, I'm saying it anyway) that Guardians of the Galaxy was an unexpected hit. Sure, it was set in the Marvel Cinematic UniverseWhen it first began in 2008 with a little film called Iron Man no one suspected the empire that would follow. Superhero movies in the past, especially those not featuring either Batman or Superman, were usually terrible. And yet, Iron Man would lead to a long series of successful films, launching the most successful cinema brand in history: the Marvel Cinematic Universe. which certainly gave it a leg up at the Box Office, but it was still a weird little space epic about third-tier characters (and no Iron man to help sell it). Most people didn't expect the film to be good (no matter how amusing the trailers for it were). And yet, it became a massive smash and cultural touchstone. Thus, expectations were pretty high for the sequel, Guardians of the Galaxy Vol. 2. 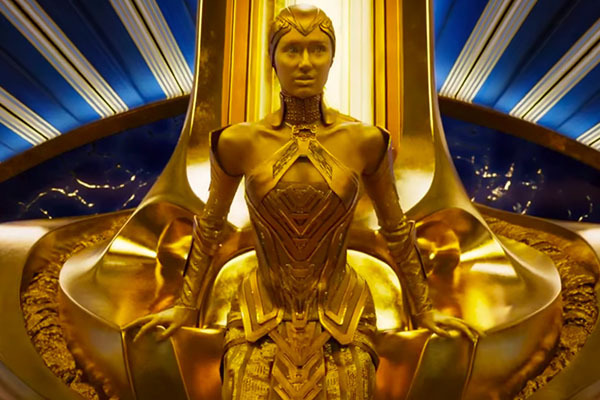 The trailers for the film promised more of everything people liked from the first movie: more humor, more action, more Groot, and more of writer/director James Gunn's weird sensibility at play. 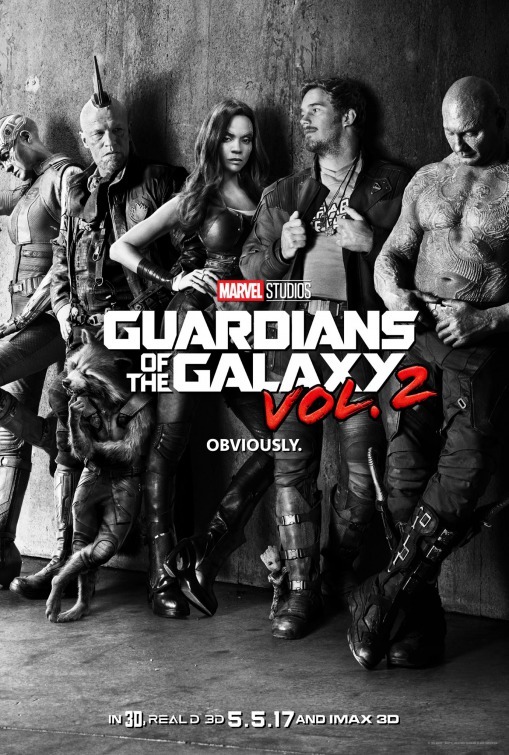 The sequel didn't have to sell audiences on the concept of the Guardians, but that didn't mean the film could just coast -- expectations were high, so the movie had to really deliver on all the promises in its sequel concept. In many ways the film did, in fact, deliver. Vol. 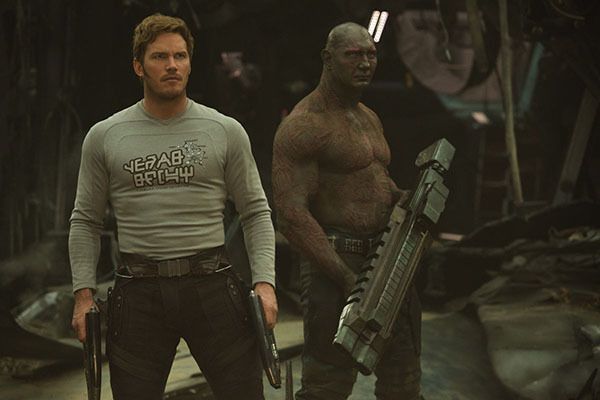 2 picks up soon after the events of the first film with Star Lord (Chris Pratt), Gamora (Zoe Saldana), Drax (Dave Bautista), Rocket (Bradley Cooper), and Baby Groot (Vin Diesel) parrying their fame over saving the galaxy in the last film towards getting new mercenary jobs. The action opens immediately with the team taking on an inter-dimensional beast for the Sovereign system, protecting the possessions they hold most dear, very powerful and expensive batteries. After the fight, though, we find that Rocket has stolen some of the batteries for himself, which then leads the Sovereign to chase down the Guardians' ship and shoot it out of the sky. The Guardians would be dead if not for the intervention of Ego, a very powerful alien who, also, just so happens to be Star Lord father. Yes, as hinted at the end of the last film, Star Lord's alien father is a super-powerful being. Known as a "Celestial", Ego is a God (or, as he puts it "little g"). he's also a living planet, but one that can create a human avatar for itself. This avatar is the man that met Star Lord's mother back in the 1980s which lead to Star Lord's own birth eventually. Now, with his father back in his life, Star Lord gets to learn all about his alien side and all the cool things he can do with his Celestial powers. But Ego seems to have a secret agenda, and once everything is revealed, Star Lord may just discover that Ego isn't the father he was looking for all along. The single biggest complaint I (and many others) had about the first Guardians film was that the film's villain, Ronan the Accuser, wasn't a very interesting villain at all. Vol 2., then, needed to give us a villain that was actually interesting, one we could invest in so we cared about the stakes of the movie. Ego, filling that role, is an improvement in many ways, although I still don't think he's one of the best villains in the MCU cannon. Working in Ego's favor is that he's played by Kurt Russel, and Russel can act the hell out of any part. Ego isn't the most fleshed out character, an omnipotent being who really isn't relatable except within the confines of his relationship to Star Lord, but with Russel's gravitas and his chemistry, the character almost works in his hands. If nothing else, Russel had a grand time chewing scenery as a living god, bringing a lot of life to his scenes. Betraying the character, though, is his whole big "evil villain plan". Ego hates being the only one of his kind. Exploring the stars in human form, he found many mortal beings but he never engaged with any of them. It was only with Star Lord's mother, Meredith (Laura Haddock), that Ego found someone he could really relate to, falling in love with the woman. However, despite falling in love, Ego still wanted to really engage with the whole universe, which is why he started planting seeds of himself everywhere. His goal was the cover the surface of every planet in the universe with a version of himself so he could be everywhere, feel everything. In short, it's a really stupid plan. If Ego's plan was the find connection with others in the universe, he already did that with Star Lord's mother. If his goal was to find (or create) another like himself, all he had to do was wait for Star Lord to be born -- the god is millions of years old and you're telling me Ego could wait the however many months or years it took for the kid to grow into his abilities? That instead of being patient and enjoying his time with Meredith, he decides to go back to his planet and continue his "great work"? It doesn't really hold up to examination. The only way that makes any sense is if the god is just totally bonkers insane. The problem there is that an insane character is hard to relate to in any way, and if you can't relate to them you can't invest in them. 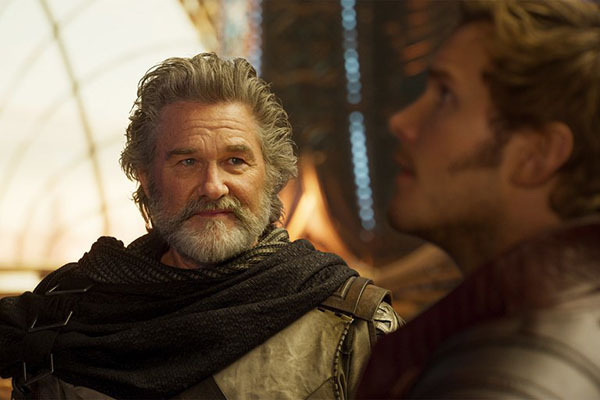 I can invest in Kurt Russel because he's a fantastic actor, but even Russel can't sell this thin villain plot, the standard, generic "take over and destroy the entire universe" story the movie concocts. And if Ego was played as more bonkers, more insane, we'd never invest in him at all -- the most famous insane character, the Joker, is many things but he's very much not a relatable character (but then he also doesn't want to destroy the world, a mark in his favor). The movie, then, is missing a core element to really make it sing. That means the rest of the movie -- the main characters, the humor, and music -- has to fire on all cylinders to make up for it. In this regard the film does deliver, with this movie being even funnier than the first movie. All the actors have developed their chemistry together, allowing them to all play off each other and deliver their lines with greater aplomb. They've given a script with more humor (and more emotion) than the first movie, and the film really is really able to bring it all together to make you care about everyone and everything happening (so long as it doesn't actually involve Ego). They're even able to sell some revisionist content, reinventing Yondu (Michael Rooker), the nominal anti-hero from the first film, into more of a father figure for Star Lord. 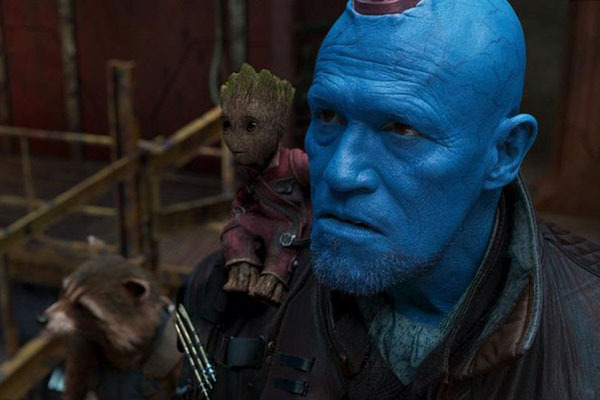 His reinvention of the character doesn't feel entirely out of character since Rooker always played Yondu with a bit of warmth under the surface. It also suits the story of the film -- Star Lord is looking for his father and, wouldn't you know it, his "real" father figure was in front of him the whole time. I didn't hate Yondu in this first film, but he's certainly more enjoyable here, given a greater role (and more of the feels) in the sequel. I do think Guardians of the Galaxy Vol. 2 is a better film than the first one, even if its only by degrees. The cast and crew clearly loved making this movie, and it shows in ever lovingly crafted scene of the movie. Maybe the real problem with the film is that the movie couldn't stray too far from the source material and Ego is just a villain that's un-filmable in a single adventure. Perhaps if they'd given him more time to grow in our minds, or if they could have just used a different villain in this capacity, the movie would have truly come together. It's a sequel that stumbles a little on its path to greatness, keeping it from being among the best of the MCU. Of course, with Disney's firing of James Gunn, the mastermind of both these movies, I have serious doubts if the planned third film is going to be able to achieve even modest greatness. December 14, 2018: Was Brandy Really a Fine Girl?